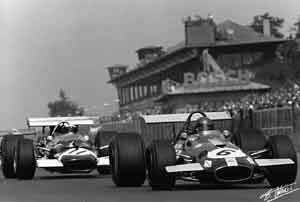 With small F1 grids in 1969, the German race organizers decided to run a Formula 2 event concurrently, with a separate grid as had been done on several occasions in previous years. This was fortunate as Ferrari withdrew at the last minute. There were 12 Formula 2 cars entered but multiple European Hillclimb Champion Gerhard Mitter crashed his BMW F2 car at Flugplatz on Friday and was killed. The other BMWs of Hubert Hahne and Dieter Quester were withdrawn and Mitter's close friend Hans Herrmann also withdrew his Winkelmann F2 Lotus, cutting the F2 field to eight cars. The Formula 1 entry was as it had been at Silverstone two weeks earlier (apart from Ferrari being absent) with Jack Brabham still out of action with a broken ankle. The only addition was Mario Andretti in the four-wheel-drive Lotus 63. Qualifying resulted in Stewart (who was 32 points ahead of Jacky Ickx in the World Championship after five wins in six races) being beaten to pole by the Belgian Brabham driver. Jochen Rindt completed the front row in his Lotus 49. Jo Siffert was on the second row in his Walker-Durlacher Lotus with Denny Hulme (McLaren) alongside while the third row consisted of Vic Elford (Antique Automobiles McLaren), Piers Courage (Frank Williams Brabham) and Bruce McLaren (McLaren). Graham Hill was again off the pace in ninth and Andretti was 12th. John Surtees declared himself a nonstarter, being disenchanted with the BRM139 on the grounds that the car was unsafe. At the start Ickx did not get away well and so Stewart led Siffert and Rindt. On the first lap Andretti crashed the four-wheel-drive Lotus and Elford ran an errant wheel which flipped the McLaren. It landed upside-down in the trees. Andretti helped Elford out of the wreck but the Englishman had broken his arm in three places. In the early laps Ickx worked his way back to second and then closed up on Stewart, who had built up a nine second lead over Siffert. The Belgian spent the next four laps right behind Stewart but on lap seven managed to get ahead. Stewart held on but then gear selection problems began to slow him and he dropped away, leaving Ickx in a dominant position. He won by nearly a minute. McLaren was third but he was nearly two and half minutes behind Stewart.